What if I told you there was a potential 38% return on investment for dentists who update their offices – through redesign or new construction – after the first full year and an additional 38% the following year, if they do it right? Why Attend the Inspiring Success event? Dr. Tholen will provide individual plan consultation, during the session, to those participants who bring copies of their office plans with them! 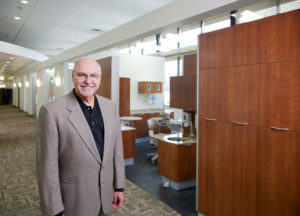 If you are planning a dental office remodel or ground up construction project, attending Dr. Tholen’s lecture on dental office design is a must. Not only did we find the lecture highly informative, it was also very inspiring. Each year, A-dec and Henry Schein team up to provide a new and innovative CE conference schedule designed to keep attendees current, while at the same time providing a forum for professional dialogue with colleagues. It is our goal for attendees to receive a collegial, professional experience focused on dental care and community at the greatest possible value. in partnership with Henry Schein, will be hosting a winery dinner the first evening of the event. We are pleased to offer this 8 credit CE learning event for $575. Fees include event meals and three night’s accommodation for two. For more information and to reserve your spot at the next Inspiring Success event, call your Henry Schein Dental representative or register here. *Continuing Education credits are recognized by the ADA Continuing Education Recognition Program (ADA CERP) and the Academy of General Dentistry Program Approved for Continuing Education (AGD PACE).